Well actually, yes it does. But if I would have titled this article as such, you probably wouldn't have read it because at least 75,000 other articles and blog posts written this off season have made reference to how deep the Brewers starting rotation is. The Brewers have eight pitchers vying for five spots in the rotation. Even with injuries to Yovanni Gallardo and Chris Capuano, baring a trade, a pitcher with a significant amount of major league experience and/or potential will have to be sent down to AAA. This plethora of pitching is keeping Ned Yost up at night. Because of this glut of pitchers, there has been much talk of the Brewers trading one of their starters, even for minor league prospects, just to clear the logjam. There has been almost no talk at all of the Brewers trying to add another pitcher to their staff. I think this is shortsighted on their part. This pitching staff is very good. 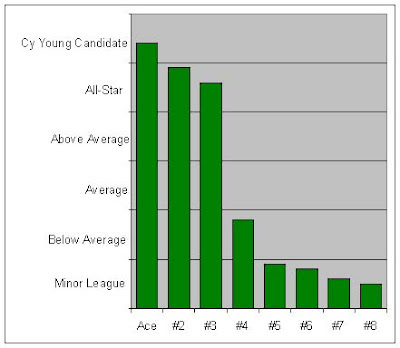 It has a Cy Young candidate as its ace and two other All-Stars. This staff will undoubtedly win a lot of games. It is not at all, however, deep. 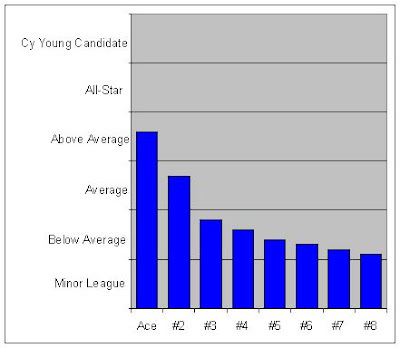 The fourth starter is below average and their are no major league caliber pitchers to fill the #5 spot. This staff is very deep. It has eight pitchers who are of major league caliber. It is not, however, very good. You might call this staff the Milwaukee Brewers and you might call the last six bars on this chart Jeff Suppan, Claudio Vargas, Manny Parra, David Bush, Chirs Capauno, and Carlos Villanueva. I fear that the larger number of starting pitchers on the Brewers staff has led them (and led many fans) into a false sense that the staff will also be rather good. The reality is that the Brewers starting staff isn't particularly good. There are probably 100 pitchers in the Majors who would step right in to the Brewers rotation if we had them. Five of those pitch for the Chicago Cubs. In order to win the National League East, some of the Brewers young starters - those with more upside potential like Gallardo, Parra, and Villanueva - are going to need to make their bars quite a bit taller. Those are the ones the Brewers should bring north. If they do so, then they are playing to win. If instead they bring the more known quantities of Vargas, Bush, and Capuano, they are playing to not lose. That's a game you can never win.